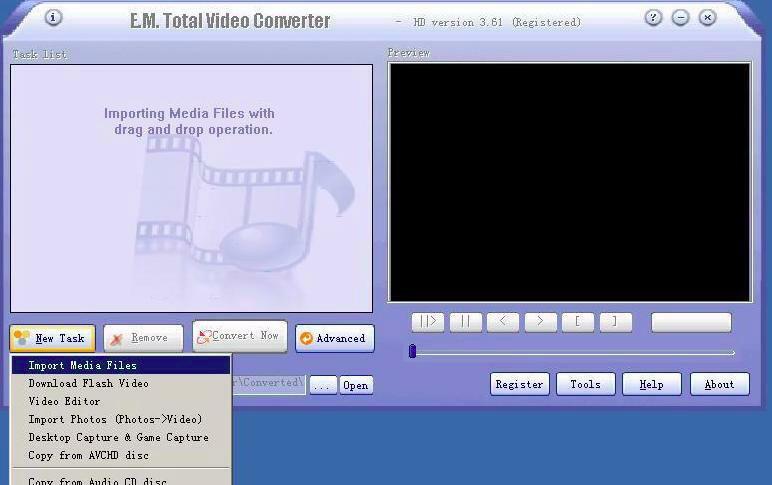 Total Video Converter is a powerful DVD burner which burn video to DVD with high quality. 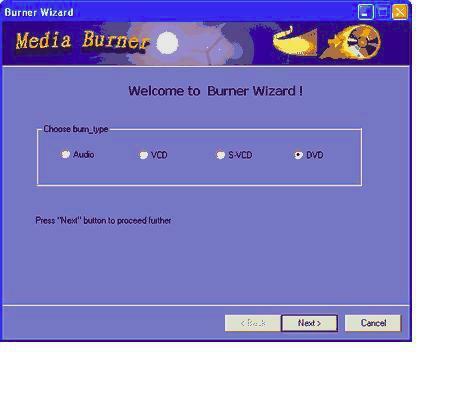 The DVD burner also converts other popular video and audio formats including mp4, psp, mpeg, 3gp, flv, mov, asf, wav, wmv, mp3, aac, mmf etc. Meanwhile, it supports for converting and burning video to HD formats like H.264 TS, Mpeg-2 TS, WMV-HD, MKV-HD, DivX-HD, Divx-HD, MOV-HD, FLV-HD and MP4-HD. 1.Download free trial Version here: Total Video Converter Or Total Video Converter for Mac. Then install and lauch this program. Restart the computer and open the DVD Burner program. 2.Click new task, then you can see the Total DVD Burner interface. Choosing the button “convert & burn” you will see the following window. Select the button which pops up . Choose the suitable format DVD. You start the Media Burner. 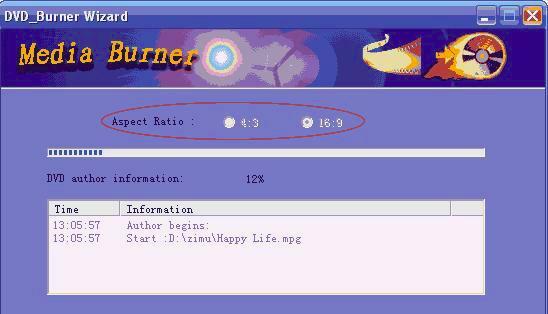 4.Click the “Next” button and the system will Look up the chosen burning equipment. If you want to burn DVD,you need a DVD. If your CD is erasable ,you can click “Erase” button to erase the CD. (1) To burn DVD,it is important that the information(video format,video size,aspect)of each DVD mpg file must be the same,or it can’t be added. For example,if you choose PAL, 720*576,16:9,you can’t add the files like NTSC, 720*480,16:9.The information of the files to be added will be displayed in the list box that you can see in the following dialog. (3) To burn Audio file,the supported audio formats include MP3,WMA,WMV,OGG,etc. DVD AUthor is to pack mpg files up to generate .vob .ifo .bup files. AUthor begins when you click “next”,you can adjust Aspect to 16:9 or 4:3 according to your request before you click “next”. 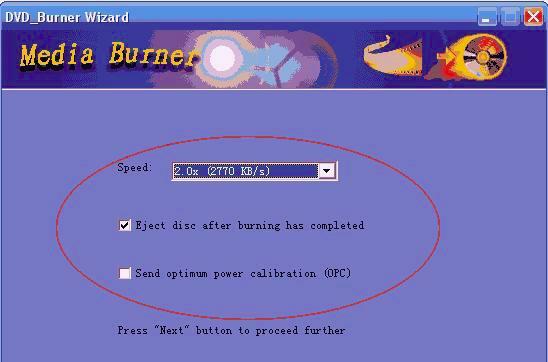 You can set the burning speed and select the check box whether pop up CD and send to OPC automatically or not after finishing burning. 8. Please click “start to burn” to begin burning. Before burning Audio VCD SVCD, you can click “test” to test. * Convert and burn all general and HD videos to MPEG2 TS HD which can work on PS3, Xbox, Apple TV, iPod, iPhone, and a wide range of portable multi-media devices! Besides, You can also convert all general and HD videos to standard videos. * Auto detects your CPU and supports multi-core CPU providing you with the highest conversion speeds; Advanced profile settings are available for you to define the output parameters. * Easily capture games to video files that supporting various video formats and download flash videos (winXP) from video-sharing website.